The Mid-Atlantic Regional Archives Conference (MARAC) offers travel awards of $400 and $250 for attendance at our conference in Pittsburgh, April 14-16, 2016. Scholarship funds may be used for conference registration, workshops, lodging, conference meals, and other travel expenses. Persons meeting the criteria outlined below are encouraged to apply. TO APPLY: Submit a current resume, a cover letter including a statement of the expected benefits of attending the MARAC meeting, and a letter of reference from a person with knowledge of the applicant’s work or educational program. Send application materials to Laurie Sather, MARAC Education Committee Chair, at lsather@hagley.org. DEADLINES: For the MARAC conference scholarship, the deadline for receipt of applications is February 29, 2016. The Mid-Atlantic Regional Archives Conference (MARAC) offers awards for one full or half-day workshop, and conference registration, including the Friday Luncheon and Saturday Breakfast. Named in memory of Karen A. Stuart, a Library of Congress archivist who had been head librarian at the Maryland Historical Society, this award is expressly aimed at those associated with Local History Collections. Active with MARAC on the Publications Committee and also as Maryland Caucus Chair, Karen maintained a life-long interest in local history and genealogy, respecting and encouraging the scholarly practice of each. In her career, she assisted thousands of researchers investigating Maryland local history, and through her guidance she also impacted the careers of local history practitioners throughout the state. Karen loved local history so it is fitting that this award bears her name as MARAC supports the professional growth of others dedicated to the field. QUALIFICATIONS: Individuals must currently be associated with a local history collection that is open to the public on a regular basis in the MARAC region. Volunteers as well as paid staff would be eligible. Priority would be given to local history collections located in the meeting’s host city for the purpose of networking opportunities, but would not exclude other applicants. APPLICATION: Applicants should submit a current resume, a cover letter describing their organization and demonstrating financial need, a statement of the expected benefits of attending, and one letter of reference from a person with knowledge of the applicant’s work. TO APPLY: Send application materials to Laurie Sather, MARAC Education Committee Chair, at lsather@hagley.org. DEADLINES: For the Karen A. Stuart Local History Collection Workshop & Conference Attendance award, the deadline for receipt of applications is February 29, 2016. The Albin O. Kuhn Library & Gallery at the University of Maryland, Baltimore County (UMBC) is excited to announce the release of new and updated records for the Library’s archival collections, a major milestone in providing easier searching of the holdings. The 16-month-long project creates collection-level records and implements an Encoded Archival Description (EAD-XML) compliant workflow for the collections. As of January 2016, Library staff have successfully updated over 100 finding aids and collection-level records, and created new collection-level records for nearly 50 previously-undescribed archival collections. A workflow was created to convert records to both EAD-XML and MARC-XML formats using national descriptive standards. These records will be made available in multiple access systems including the Library Catalog, the Special Collections Search (PastPerfect Online), and through union catalogs such as OCLC’s ArchiveGrid and the National Library of Medicine’s History of Medicine Finding Aids Consortium. The updated records will facilitate access to UMBC’s archival collections and help to more effectively reach the researchers, scholars, students, and community members that are seeking the unique materials held at UMBC. 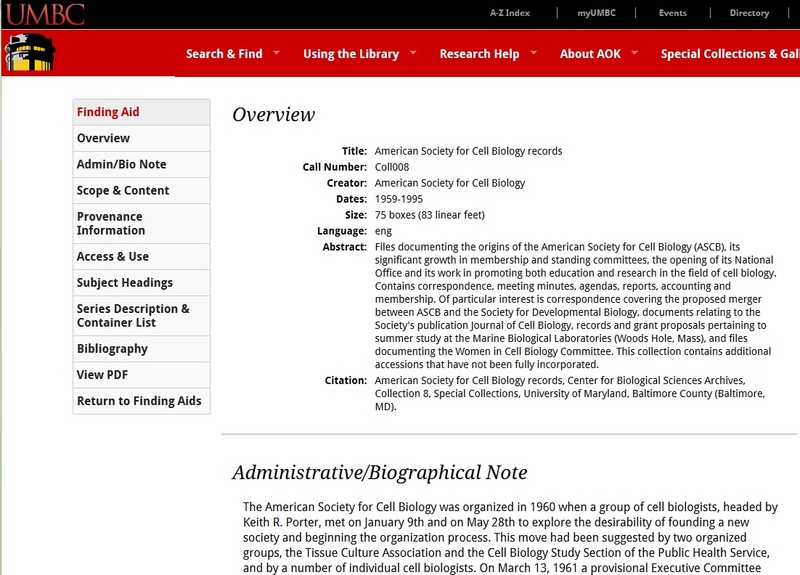 Screenshot of the new online finding aid for the American Society of Cell Biology records, Collection 8. These new and updated collections are now searchable from the Special Collections page on the Library’s redesigned website, as well as through the Library Catalog. Users can also browse the full list of archival collections on our new Finding Aids page. The project is funded by a grant from the National Historical Publications and Records Commission (NHPRC), the granting agency of the National Archives and Records Administration (NARA), as a part of their Documenting Democracy: Access to Historical Records program. Library staff from the Special Collections, Bibliographic & Metadata Services, Library Information Technology Services, and Reference departments partnered on the creation and accessibility of the records. In future months the project will allow us to further streamline the updated workflow and continue to create and update new collection records. The experiments with the traditional meeting model that began in Roanoke continue to Pittsburgh with “Pittsburgh Popups” – two sessions offering presenters and attendees alike a potpourri of archival topics, issues and projects to inspire and engage with the latest research and projects taking place throughout the region. To this end, the program committee has set aside slots on Saturday, April 16 (S19 and S24) for presenters to share the latest and greatest going on in their own volunteer, work, study, or research spaces. No need to organize a cohesive panel, just tell us what you’re working on! Presentations should be approximately 15-20 minutes apiece. What does this mean? About six weeks before the conference, you’ll receive a link to a Google form to submit a brief proposal for your submission to the Pittsburgh Popups. All proposals will be due by Monday, March 28 at 9am. Descriptions should be no more than 250 words long. About two weeks before the conference, MARAC members will vote on proposals. Those with the highest vote counts will be assigned to a Pittsburgh Popups session and selected panelists will be notified by end of day, Friday, April 8. We hope all MARAC members – regardless of rank or experience – will view this as an opportunity to experiment with new ideas and get feedback on projects that have recently ended or may be ongoing still. Positions on all panels are open to everyone, regardless if you are presenting elsewhere in the program. Questions? Please contact either Lora Davis (ljdavis@jhu.edu) or Deirdre Joyce (djoyce@clrc.org), PopUp Session Coordinators. Check out the latest issue of the “Governance and Recordkeeping Around the World” newsletter, which is now online. The cover theme is “The Information Advantage: Unlocking Value from Information”. If you’re attending MARAC Pittsburgh this spring (April 14-16, 2016), you may be interested in our rideshare/roomshare spreadsheets, our navigator program, and our informal networking happy hour. Please see below for information on all three opportunities. Please don’t hesitate to let me (Sara Borden, sara.a.borden@gmail.com) know if you have any questions. Also, please feel free to share this with anyone who may not be on this list. MARAC has created two Google spreadsheets to help you find rides and roommates for the upcoming conference in Pittsburgh. Further information is listed below and on our upcoming conferences webpage. Please email Membership Development Committee Chair Sara Borden atsara.a.borden@gmail.com if you have any difficulty using the spreadsheets. Use the following spreadsheets to find fellow MARAC Pittsburgh attendees to share rides and hotel rooms. These spreadsheets are editable by anyone and all attendees are welcome to use them. Once you have found a ride or roommate, please come back and edit your information accordingly. The spreadsheets are intended for informational use only. This is not a matching service; you need to use the information on the spreadsheets to find people with whom to share rides and rooms. Please use good judgment and common sense when reaching out to strangers. MARAC and MARAC officers are not responsible for the contents of these spreadsheets or for any actions that result from using these spreadsheets. The spreadsheets will be deleted on April 23, 2016, one week after the MARAC conference ends. Do you have advice to give about making the most of a MARAC conference? Are you looking to get advice on how to make the most of a MARAC conference? The Mid-Atlantic Regional Archives Membership Development Committee is offering a navigator matching service for the Spring meeting in Pittsburgh, PA (April 14-16, 2016). Navigators will agree to meet with new members before or during the meeting to help them take better advantage of the networking and educational opportunities the meeting has to offer. Please fill out the form if you’re interested in serving as a navigator or would like to be matched with a navigator. Please note that we cannot guarantee that you will be matched if you fill out the form. If you’re planning to attend MARAC Pittsburgh (April 14-16, 2016) and you’re looking for a more informal networking opportunity, the Membership Development Committee will meet for drinks and chats with our fellow meeting attendees before the Friday reception on April 15. Join us in the Omni William Penn’s Tap Room between the end of Friday’s final session and before the reception at the Heinz History Center. If you have questions about school, getting started in the profession, career advancement, or anything else you can think of, and you’d like a more relaxed atmosphere, this will be the place to be. No need to RSVP, we’ll be totally informal, hanging out and talking until we’re ready to head to the reception. Please don’t hesitate to contact me (sara.a.borden@gmail.com) with any questions. Hope to see you in Pittsburgh! You may also wish to take a look at the newly renovated MARAC Job Opportunities page. It is currently the most up-to-date resource for job hunters in the mid-Atlantic region and will be updated frequently. Be sure to take advantage of this great new resource MARAC is offering its members. In light of the recent winter in the Mid-Atlantic Region, the deadline for nominations for the MARAC Distinguished Service Award has been extended to Feburary 12, 2016. If you know of a deserving MARAC member, please consider submitting an application to John LeGloahec, Chair of the Distinguished Service Award Committee. Applications may be sent via email to legloaj@gmail.com or via USPS to John LeGloahec 5703 Greenleaf Road Cheverly, MD 20785. For more information, please feel free to contact John, or any of the other committee members, Fernanda Perrone (hperrone@rulmail.rutgers.edu) or Rebecca Johnson-Melvin (lrjm@udel.edu). For additional information about the Award, please see the DSA page on the MARAC website, available athttp://www.marac.info/distinguished-service-award-. The nomination form is available at https://marac.memberclicks.net/assets/documents/2016dsanomform.doc. Do you know a MARAC member who has made a difference in the lives and successes of others? If so, please consider nominating him/her for MARAC’s Distinguished Service Award. This award recognizes members who have made significant contributions to MARAC and to the archival profession. Please note that service to MARAC is weighted more heavily than service to the profession as a whole. The Committee strongly recommends providing multiple letters of support. Nominations may be sent at any time via email or regular post. The official deadline is February 12, 2016. All nominations must be received by this date. The 2016 MARAC Election is now open. Online voting through Survey Monkey and paper ballot voting is available from February 1-20, 2016. Please read the candidate bios hereand complete your ballot by the 20th. Your vote is important every year, but especially so in 2016, as MARAC elects members to several new positions created by the recent bylaws revision. MARAC members will be electing a Chair-Elect, the Awards Committee Chair, and 6 members of the Scholarship Committee. Members elected to these positions will take office on July 1, 2016. If you have not received your electronic ballot (or the paper ballot if you opted for paper-based voting) in a timely fashion, please contact Tammy Hoffman, the MARAC Administrator, at administrator@marac.info. Members who have questions about the voting process are welcome to contact Charlotte Sturm, the Nominations and Elections Chair, at charlotte.sturm@gmail.comor 301-837-0602.